Our brand new Swift Bordeaux prestige caravan sleeps 6 to a high degree of luxury, it is double glazed and centrally heated so why not stay for early or late season breaks as well as that restful time during the summer. Located with amazing views over Chesil Beach and Lyme Bay to east Devon. Free WiFi is available. We have 3 bedrooms including a master double with en-suite. We also cater for babies, even twins with 2 cots and high chairs and a baby bath. The kitchen is fully equipped and the lounge very comfortable and with far-reaching views. Our large private patio area has a wooden picnic table and a BBQ which you are welcome to use. We have Wifi in the caravan. The caravan is well positioned for the site facilities and we offer Check ins on any day. Why not let us help you celebrate that special occasion by providing champagne, chocolates etc. for a nominal extra cost. For Mums and Dads there is an excellent Show bar with exciting and glamorous evening entertainment. The kids can be happy here too with many early evening activities complete with cartoon characters on show. The restaurant caters for all tastes at a very reasonable price. For those who want to cater for themselves there is a Spar shop, fish and chip takeaway and Papa Johns Pizza, which also offers delivery to your caravan. These amenities are accessible with a Haven club pass which is available from the main reception upon arrival for an additional charge. There is also a self service laundry on site in addition to a Starbucks cafe, a Mini-Market and a Fish and Chip shop; no passes are needed to use these. There is free WiFi is Starbucks. The famous sandy beach of Weymouth is just a short bus ride away, on the Littlesea dedicated hourly bus service. Here your children can play in the sand, build sandcastles and take a ride on the friendly donkeys. The town services are just a 2 min walk away from the beach. The town hosted the 2012 Olympic sailing and you can visit the sites and take a trip up the new observation tower for a spectacular view across the Jurassic coastline as the platform spins slowly through 360°. Alternatively you can take a walk back in time along the picturesque and working harbour. Just a half hour drive to the West takes you to the world-famous Abbotsbury subtropical gardens Children's Farm and Swannery, whilst to the East takes you to the world-famous Lulworth Cove and Durdle Door, Monkey World and Bovington Tank Museum. If you prefer walking, the spectacular South West Coast footpath runs right through the site and it is easy to stroll along the coast in either direction and get lost in nature as the waves wash against the Chesil bank. We are a retired couple having left the teaching profession in 2015. We have family spread around the world and love it when our children and young grandchildren come to visit. We retired to Weymouth, the place where Graham had always been as a child for his summer holidays and we both love living here. The long sandy beach, the healthy seaside air and the vibrancy of the local community contribute to making Weymouth a wonderful place to stay and live. We really love our caravan and hope you will too. It feels as though you are walking into a bungalow when you walk in through the door. We are also very happy with its location on the site, overlooking Chesil Beach and gaining sunshine all day long in the summer. The staff and facilities at Littlesea are also excellent and the atmosphere is warm and friendly. We have free Wifi as well. Directly behind our caravan is a woodland in which the Site Ranger regularly takes guided walks for children. At night, you can watch the badgers come out to play and in the early morning, deer can be seen grazing in the nearby field. Two comfortable sofas, a 2 seater and a 4 seater. Freeview television with DVD player and a selection of both family and childrens' DVD's for those rainy days. Plenty of games and a bluetooth radio. 32" flat screen in lounge, 22" flat screen in master bedroom. Freeview channels available. A variety of board games, cards and jig-saw puzzles. These can be hired easily and delivered to the caravan. Over looking Fleet lagoon and the sunset, with chairs for you to sit and enjoy the view and sun. An enjoyable stay on the south coast. A very comfortable caravan with everything you could need. Wonderful views of Chesil beach and the whole site. The weather, of course, made all the difference. We especially enjoyed walks along the front at Weymouth and Portland. Great views and quiet location. The property was well equipped with all we needed for a short break and the fact towels and bedding were supplied was a real bonus. Everything was clean and well kept and the bathrooms were in immaculte condition. Overall a thoroughly great property with many advantages. Many thanks for staying in our caravan and for your kind comments in review. We are so pleased that you enjoyed your stay and look forward to hosting you again some time. Marian and Graham. We had a lovely stay in this beautiful caravan the owners are lovely as well,very welcoming and understanding, would return. What an excellent stay! Graham and Marian are perfect hosts and their caravan is beautiful. 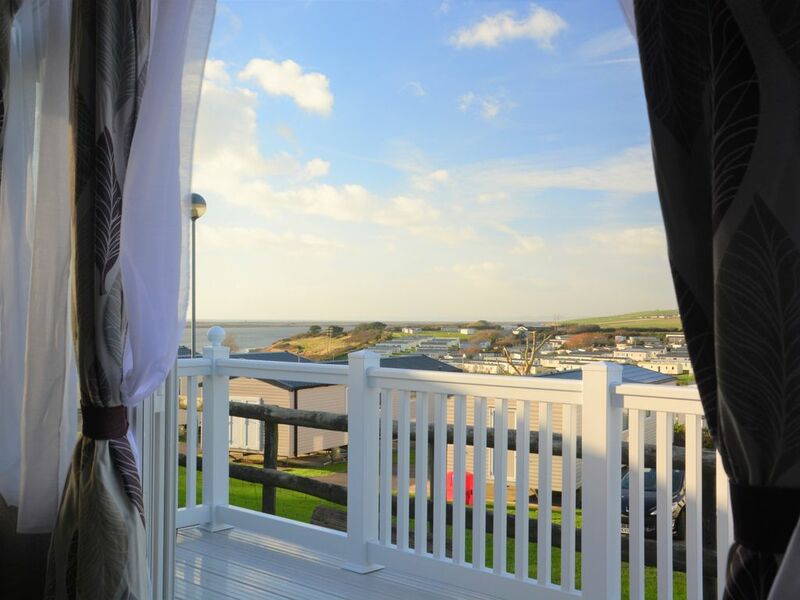 It feels more like an apartment with lots of space and a great balcony overlooking the quiet and peaceful holiday park and sea. Caravan is equipped with Freeview TV, DAB radio, DVD player, books and board games or the holiday club is a minutes walk away and Weymouth is a short 10 mins drive from the park - so you'll never get bored of things to do! Graham and Marian really think about their guests needs. During our stay I found lots of cleaning stuff, shampoo and conditioner, towels, ironing board with iron, hoover, hair dyer, mop, bits of food in the fridge, tea, coffee and sugar all stocked up - Graham even met us when we arrived and brought us some bread and bananas and a fan as the weather was scorching! Basically, you could arrive with your clothes and find everything else you need in the caravan, should you need it. Beds are super comfy and bedding provided is top quality. Living area has two very comfy sofa for you to relax in after a hard days exploring. Main bedroom has en suite toilet and bathroom has another toilet with generous shower. The caravan has ample parking and lots of space for the kids to run around outside whilst still remaining safe. In short I would recommend this luxurious caravan to anyone wanting a peaceful but fun packed holiday right in the heart of the action in Weymouth. everything is so close by and the caravan is so nice it really is the perfect British getaway. Thanks to Graham and Marian for making our stay so wonderful. Wow, what a fantastic review, thank you so much. We are really delighted that you enjoyed your stay so much and appreciated the thought that we put into helping our guests enjoy their stay. We hope that you will be returning in the not too distant future and would like to offer you a 10% discount, as a returning guest, for any future stays. Best wishes, Marian and Graham. Perfect for a fun family bank holiday weekend! 3 generations for three nights over the bank holiday weekend and the static caravan was perfect for everyone. Spacious, very well appointed accommodation meant that we all felt instantly at home and relaxed straight into our holiday. The wonderful sea view and close proximity to the coastal path was an added bonus. Whilst we didn't use the on-site swimming facilities etc., the children loved Weymouth town beach with its soft sand and shallow water. Graham and Marion were perfect hosts and we felt very well looked after. I'm sure we will be returning soon! Thank you so much and we are really pleased that you all had such a good time. Thank you also for looking after our caravan and leaving it in such a clean state. We look forward to hosting you again any time. Many thanks for your positive review. We are pleased that you enjoyed your stay in our caravan and we hope to be able to welcome you again on future diving trips to Portland. The famous sandy beach of Weymouth is just a short bus ride away, on the Littlesea dedicated hourly bus service. Here your children can play in the sand, build sandcastles and take a ride on the friendly donkeys. The donkeys have been a feature of the beach here for over one hundred years. The town's shops are just a 2 min walk away from the beach. Weymouth hosted the 2012 Olympic sailing and you can visit the sites and take a trip up the new observation tower for a spectacular view across the Jurassic coastline. Alternatively you can take a walk back in time along the picturesque and working harbour. Less then 20 minutes away, children can cuddle the guinea pigs, ride the ponies, race the tractors, play in the large undercover play area, jump around on our new bouncy castle (don’t forget your socks!) and bottle feed the lambs. The lambs also have a midday race around a track, after the race the children are invited to take a lamb for a warm down walk on a lead. Whilst to the east takes you to the world-famous Lulworth Cove and Durdle Door, Monkey World and Bovington Tank Museum. These are accesible from the site on the X55 hourly bus service. Further to the west, are the famous beaches and cliffs of Lyme Regis and Charmouth, were fossil hunters regularly find fossil dating back to the Jurassic period in time.